Rarely do I find a product that I like so much that I spoil the story at the very beginning of my review, but this is one of those products. I love the mykeyO executive restt™ (restt™). 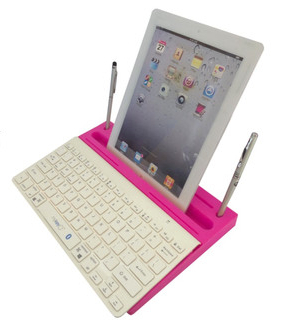 It is a keyboard caddy, an iPad stand, a pen holder, and under the keyboard rest, there’s storage for all the clutter on your desk. As soon as the restt™ arrived, I placed it under my keyboard and I haven’t tossed it aside or changed its location at all. The restt™ has found a permanent home on my desk. The Apple Wireless Bluetooth Keyboard (not included with the restt™) fits perfectly into the keyboard slot. As you can see in the picture, you can raise your keyboard to reveal all your goodies stored below. 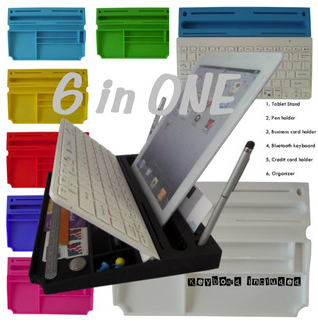 Your iPad, iPhone, or other tablet fits nicely into the large slot so that you can work with your device as if it were a laptop without the rigidity of a laptop. Plus, your device is close enough and tilted just right so that you can tap and swipe as needed. I use the restt™ as a keyboard caddy for my Apple Wireless Keyboard for my Mac mini, but the cool thing is that I can place my iPad or my iPhone into the slot and have it there handy as well. In fact, as I write this post, my iPhone is in the slot. I have to keep track of my retweets and messages, so this makes it very convenient. Plus, the restt™ is made of silicone rubber, which means that it’s rigid enough to be stable and sturdy for typing but soft enough to absorb the vibrations from typing and from my ever-vibrating phone. Silicone rubber also won’t scratch any surfaces nor will it make those odd looking greasy spots that some pure petroleum-based rubber products do. And silicone rubber is easy to clean and it doesn’t fade or turn funny colors as it ages. This is a product that you’ll have around a while. I haven’t found any flaws or negatives with the restt™. It’s a thoughtfully made product that really helps keep my sundries organized and out of sight. One notable feature is that the keyboard doesn’t “walk” around while you’re typing on it. No matter how hard you type, or how fast, your keyboard stays put. Why it’s Frugal: The mykeyO executive restt™ is frugal because it keeps you organized, it won’t harm your furniture, it keeps your iPad, iPhone, or other tablet handy, and you can take it from place to place easily. It provides you with a comfortable work surface and environment, which will make you more efficient and productive. If that’s not frugal, I don’t know the definition of frugal. Now we come to the price. $34.95 is the retail price, but you can buy it for $24.95 on Amazon and if you’re a Prime member, there’s no shipping charges. $24.95 is a very good price for the restt™. I love the design features and you have your choice of colors to boot, which coupled with its sheer utility value, I don’t think you can go wrong with it. The only stipulation is that you have to have an Apple Wireless Keyboard to use with the restt™. If you don’t have one, but want one, you can purchase a reasonable facsimile of an Apple Wireless Keyboard from mykeyO. Actually, the mykeyO version is a tiny bit wider than the Apple keyboard but is much better. It’s better because it has functions specific for Windows, Apple, and Android-based devices. I’ll have a full review of that product posted soon, so keep watching. Recommendation: Forget the rest and buy the restt™ and get yourself organized.